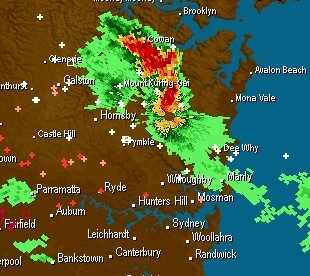 Thunderstorms are helping Sydney achieve its coolest start to summer in 51 years, according to weatherzone.com.au. Thunderstorms rolled across the city late this morning and early afternoon, cooling most suburbs below 17 degrees, well below average for this time of year. The storms also brought brief rain and hail to some western and northern suburbs. Picnickers and beach-goers were sent scurrying. “In the first four days of this summer, Sydney has now failed to reach 23 degrees, making it the coolest start in 44 years,” Weatherzone meteorologist Brett Dutschke said. “The city is on target for its coolest start to summer in 51 years with none of the next three days expected to reach 23 degrees,” Dutschke said. Obviously caused by global warming, along with everything else. Tony, that is over now as we have the carbon dioxide tax to lower temps! The NT had it’s coldest Dry Season (your Winter) since records were first accurately taken. So – GW? Pffft!!! Just passing the laws is enough! It doesn’t come into force for another 7 months, but it’s working already – a miracle! So place your bets, will the warmists turn this around and say it’s further evidence of disruptive climate change or just pretend it’s not happening? @Alex Armstrong That was exactly what my warmist friend said when I told him we are experiencing the coldest summer in decades. I woke up the 3.9 degrees Celcius! But guess what now they don’t call it global warming anymore it’s CLIMATE CHANGE what the…. Dumb asses need to go back to kindergarten. One of the first things you learn is weather changes all year long all over the globe. Duh. Just thought id better give you a link to your very own Prof Ian Plimer who attended a meeting at the House of commons London on 30/11/2011. But, but, but Perth is experiencing the hottest start to summer in 55 years with +7 degrees above average daily temperatures – Global Warming is going to fry us all !!!?!?!!? Aaaaauuuuggggggghhhhhhhhh!!!!!??!!!?!?!!!! HA… These Globalists (warmists/changists) are just an absurd bunch of sheep following the pied piper! The fear mongering by Gov and greenies is purely political hype to create scarcity and rise prices. The goal is to depopulate society slowly through impoverishment, as if big companies like OIL and Gas care about a silly little Carbon Tax when their profits off exploiting 3rd world countries will be trillions, all permitted to slow carbon emissions! ridiculous. How in a ‘greenhouse effect’ hypothesis do we det global cooling … ? please. The climate is dictated by “phenomena” we still barely know anything about. The Carbon Tax is not Climate Change – it is a sting on the poor as usual, to maintain the Banksters grip on Global Governance through fear. No pollution Solution, no alternative electrical means, just a cap on resources to more easily hide price escalation. Doing what comes naturally. No doubt the warmistas will try to link the natural thunderstorms to CAGW. I didn’t know that Al Gore baby had flown into Sydney. There goes another climate theory – That when Al turns up you can guarantee that thunder, lightning and cooler weather will arrive to spoil his fear-ridden day. Can’t we corner Tim ‘Ghost Metropolis’ Flannery and show him the weather radar of rain lashing South West Australia. Great speech by American congressman. The chickens are coming home to roost.